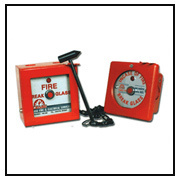 We are engaged in manufacturing and exporting optimum performance oriented range of fire alarm, fire protection, electronics security, surveillance & automation systems. These include conventional fire alarm control panels, analog fire alarm system, fire alarm hooter, commercial fire sprinklers, water fire extinguishers, water co2 fire extinguisher, abc dry powder fire extinguisher, mechanical foam fire extinguisher, cctv surveillance systems, video surveillance systems, responce indicators, wireless smoke detector and sign board. Widely used in various government organizations and hotels, our products comply with quality standards of NFPA, Fire Bridge, BS, DOT, MMD, ERTL & ISI. Following are some of the unique features of our wide range of fire alarm, fire protection, electronics security, surveillance & automation systems. In addition, we also offer Analog Addressable Fire Alarm Systems, Access Control Systems, Security Systems and Building Automation Systems. All these systems are delivered in accordance with requirements from authorities like Architects, Consultants & Electrical Contractors.